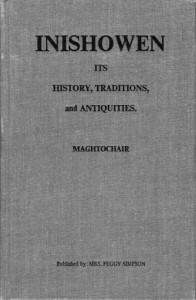 From Inishowen: its History, Traditions and Antiquities by Magtochair 1867. 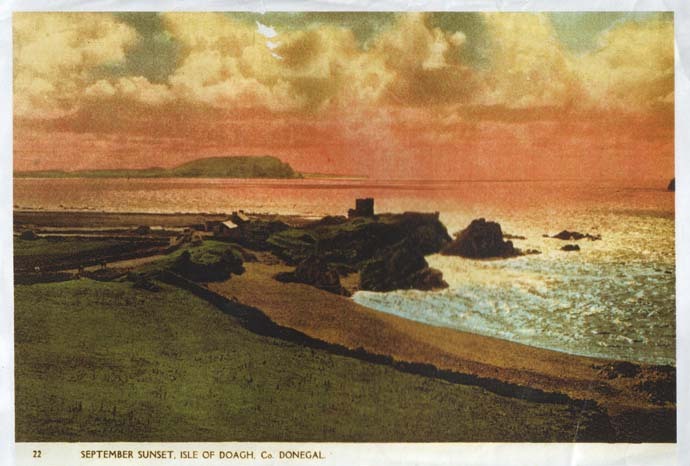 “I now proceed to give you some notes of Strabregy and the Isle of Doagh, for the benefit of tourists to our northern coasts, and of those lovers of the sublime and beautiful who may not have the opportunity of visiting this, one of the most romantic but neglected localities of Ireland. I have often thought that many of the lovers of grand natural scenery in Inishowen do not know half the beauty of their native peninsula. While they strain every nerve, and the purse strings too, to gratify their taste by visiting the glens of Antrim, the wooded beauties of Wicklow, and the enchanting lakes of Killarney, they leave unexplored at their own doors, so to say, bright spots of rare beauty and historic worth, until their claims to notice are pointed out by some tourist from a distance, or perhaps some modest village scene painter. These thoughts are strengthened by the sensation I observe created by some glowing descriptions lately published in the Derry Journal of localities to which they all had easy access, but were overlooked in the desire to see more distant places of more sounding fame, but which, perhaps, repay the sightseer no better. Are there not many of our Inishowen pleasure-seekers who know more of the Dargle than they do of Glenevin, and of the Gap of Dungloe than of the Gap of Mamore, and yet I have heard a learned D.D. say he saw nothing so bold in the scenery of Wicklow as the same Gap of Mamore; but of this again, my business now is to show you Strabregy. It’s true I’ve never beheld the beauties of Rhineland, nor have I seen the olive groves of Italy, nor sailed on the winding Seine; but I have steamed up the Thames, crossed the Forth, wandered ‘where Clydie rins smoothly,’ and strolled listlessly on the bank of the Liffey, and yet I never in all my wanderings, looked upon a scene of natural grandeur than that which is presented to the traveller’s admiring gaze as he takes his stand upon the heights above Ballin-da-bo. A hundred feet beneath him he sees the green rolling waves of the Atlantic chasing each other towards the entrance of the inlet, and, after spending their rage upon the Bar for breaking up their sport, proceed calmly into the still smooth waters of the lake. 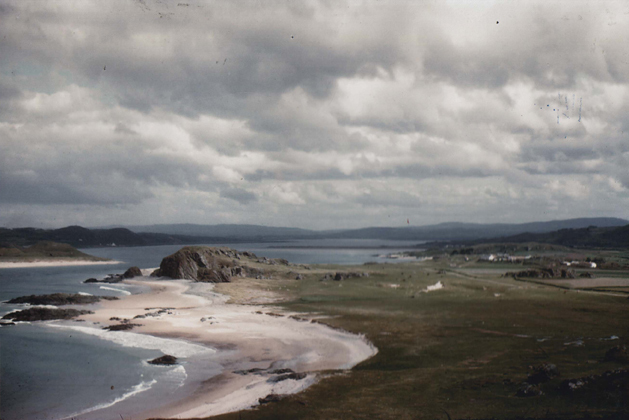 Before him, on the opposite side of the inlet, sweeping boldly round in a splendid curve, rise the Knockamenny Bens, some hundreds of feet, crowned by a richly variegated sward of heath, soft grass, and wild flowers; closely adjoining them, embossed in low sand hills , is Lag Chapel, the oldest in this part of Ireland, and immediately on the other side of the chapel Knockglass rises its lofty front in calm defence, like a vigilant sentinel keeping watch over the quiet graveyard at its feet. A short distance away at the northern extremity of the Isle of Doagh, on a rock called Carrick Brachaí are the ruins of an old castle built by one Mc Faul. Of this relic of bygone times nothing now remains but the a square tower, about 30’ feet high, the angles of which, with geometrical precision, point to the four cardinal points, and a few broken ruins, which prove that the structure was once more extensive. The view from this spot on a fine evening is singularly beautiful. Stretched out before you, like some immense living creature, its bosom constantly heaving with the pulses of life, lies the broad surface of the Atlantic ocean. Far away as the eye can reach, like a dim cloud resting on the waters, is the Island of Tory; nearer abruptly rises Glashedy, with its emerald carpet of rich soft grass; further distant the bold cliffs of Binion frown up in brown stern majesty, between which and the green heights of Cruck Aughrim the dark sharp form of Bulabin looms up in the background, the whole forming an outline at once singularly bold and attractive.